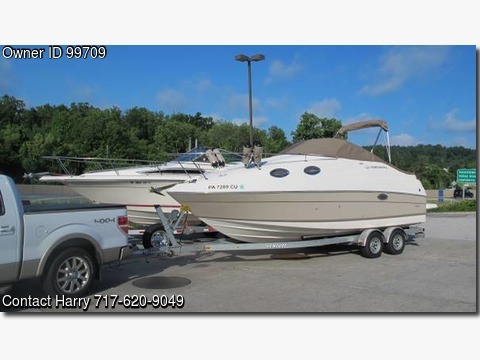 Boat is located in Mechanicsburg,Pennsylvania.Please contact the owner @ 717-620-9049 or braidedline@gmail.com…2004 Regal Commodore 2465 express cruiser with 5.0GXi, 270HP, Volvo Penta duo prop outdrive with two counter rotating stainless steel propellers, Bennington hydraulic trim tabs, 270 hours, includes 2005 Venture tandem axle bunk trailer with spare tire and carrier. Boat and trailer both very clean and in excellent condition. In the cockpit: Self draining fiberglass lined with snap-in carpet, dual helm seat, U-shaped rear seating, removable table, filler cushion, built-in cooler with storage, sink with faucet, cockpit cover, extended swim platform, outside shower, gas grill, extended Bimini top and full camper canvas. Trailer: 2005 Venture 7000 galvanized bunk trailer, tongue jack with wheel, LED stop/tail lights, tandem axles, brakes on both axles, no corrode aluminum wheel cylinders, mounted spare tire carrier, bow tie down strap, dual transom tie down straps. Cover, top, canvas, and vinyl all in good condition. Used primarily in fresh water and some in the northern Chesapeake Bay. Everything included: Fenders, lines, boat hook, life jackets. NADA at $35,000 – $40,000. Asking $33,500 USCG inspected in 2015. Clean, fully equipped, and ready for the water.